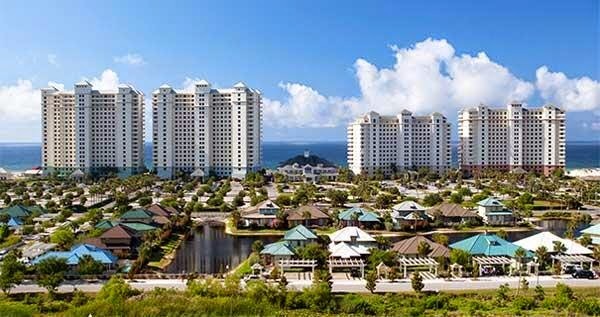 The Beach Club Resort on the Fort Morgan Peninsula is a popular Gulf Coast resort destination in Gulf Shores Alabama, overlooking the Gulf of Mexico. This two bedroom vacation rental by owner has awesome ocean-views and is a beautifully decorated condo, tile flooring was installed through-out in 2014. Come enjoy the soft-white beaches that make this area so popular the perfect place to unwind and rejuvenate your spirit in the warm sunshine! The Beach Club is a self contained resort with on site shopping, dining and entertainment. This condominium, located on the 14th floor, provides incredible views of the Gulf and a private balcony. With a king bed in the master bedroom with a queen and twin bed in the 2nd bedroom, and a queen sofa sleeper, this unit is perfect for a family or 2 couples. The living room and master bedroom open up to the balcony. Service dogs are allowed all units! Gulf Shores Alabama provides many activities such as shopping, dining, live music, championship golf courses, deep-sea fishing, entertainment and more – all within a short drive. Plan your beach escape today and experience coastal living at the Beach Club Resort.